New Orleans Spice Baseball --- 2006 and 2007 Dizzy Dean National Champions! New Orleans Spice Baseball is a NATIONALLY RECOGNIZED elite summer baseball program for high school juniors through college freshmen and was founded in the early 1990s by New Orleans prominent baseball figure Coach Wally Pontiff, Sr. to give players in the New Orleans metro area a chance to excel at high levels of baseball competition across the state, region, and country. The Spice has participated in many national events and most notably captured the Dizzy Dean World Series Championship in both 2006 and 2007. Also, the New Orleans Spice program has a tremendous track record of sending players on to collegiate and professional levels! The New Orleans Spice came up just short in the Dizzy Dean World Series championship game on Wednesday against Boynton, GA and lost 7-6 in the bottom of the 7th inning on two unearned runs. The tough loss put this year's Spice team as the 2008 Dizzy Dean Senior Division National Runners-Up. Congrats to all tournament selections - Zack Kelt (also '08 Spice team MVP), Ke Ke Isaac, PJ Donnelly, Andrew Richardson, and Craig Scelfo. The club finished the summer with a fine record of 28-11. Great Job! Spice defeat Baltimore, Maryland in bracket final to advance to 3rd straight national championship game! The New Orleans Spice behind Zack Kelt's second complete game of the tournament on the mound and KeKe Isaac's bases clearing three run double defeated Baltimore, MD in the Division A bracket final on Tuesday, 3-1. The team will advance to the 2008 Dizzy Dean World Series championship game on Wednesday at 2:00 pm against Boynton, GA. The club is now 28-10 on the season. The New Orleans Spice couldn't get much going offensively on Monday against Baltimore and fell by a final score of 8-3. The same two teams will play again tomorrow at noon with the winner advancing to the championship game on Wednesday at 2:00 PM. The club is now 27-10 on the season. The New Orleans Spice improved to 2-0 at the Dizzy Dean World Series on Sunday with a 9-3 victory over the North Florida Black Sox from Lynn Haven, FL. The team will next be in action on Monday at 3:00 PM against Baltimore, Maryland for a berth in the national title game. The club is now 27-9 on the season. The New Orleans Spice behind a masterful pitching performance by Zack Kelt held off Fowbles Baseball of Baltimore, MD, 2-1 in the 8:00 am game on Saturday. The team was led offensively by Adam Risinger's (Hahnville High) two run homer in the bottom of the first inning. The team will next play at 1:30 pm on Sunday against Florida, who defeated Alabama 4-3. The club is now 26-9 overall. The New Orleans Spice defeated the Louisiana Knights on Tuesday at SLU, 2-1. Winning pitcher Steven Barnes and reliever Zack Kelt combined for a no hitter. The club improved to 25-9 on the season and will next be in action on Saturday at the 2008 Dizzy Dean World Series in Southaven, MS. The phone number for the Holiday Inn Express in Memphis, TN on American Way is 901 369 8005. At this time, we have opened four rooms on the team block and you can call and make reservations. Sonja Moore is the contact name if there is any confusion. Just let them know that you are calling to pick up one of the open rooms on the New Orleans Spice-Danny Riehm block. There are currently three doubles and one king room open on the block. The New Orleans Spice (22-8) jumped out to a 9-0 lead and never looked back as they defeated JPRD West, 10-1, to capture their 3rd consecutive Dizzy Dean state title. The team has now advanced to the Dizzy Dean World Series in Southaven, MS where it will defend back to back World Series titles with play beginning on July 26 at Snowden Grove Park. The New Orleans Spice (21-8) defeated JPRD WEST, 6-3, to advance to Sunday's championship round in the 2008 19 and under Louisiana Dizzy Dean State Tournament. The Spice were led on the mound by winning pitcher Zack Kelt and at the plate by KeKe Issac, Adam Risinger, and Christian Bonds. The club will take on JPRD WEST on Sunday at 11:00 AM at Mel Ott Park in the championship round. JPRD WEST defeated St. Tammany 9-0 later on Saturday to advance to the championship round. JPRD WEST must defeat the Spice twice. 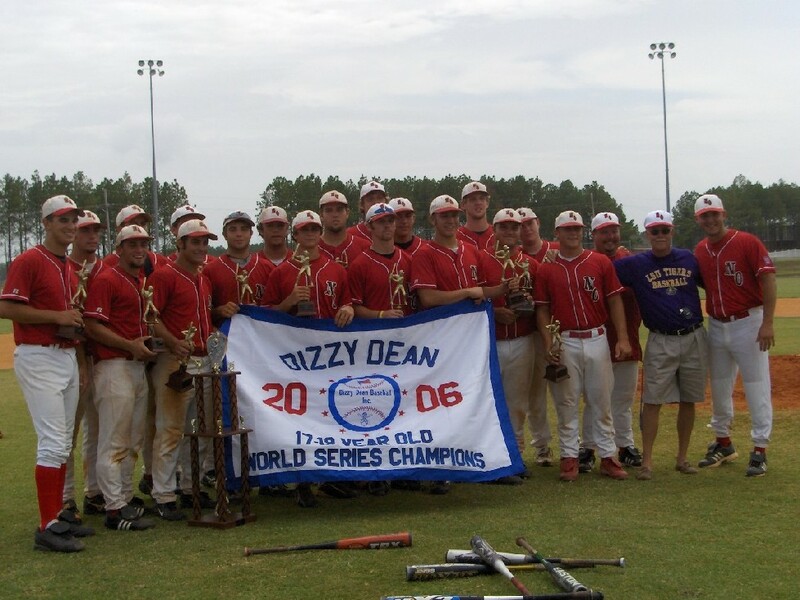 The New Orleans Spice opened the 2008 Dizzy Dean State Tournament at Mel Ott Park in Gretna in very impressive fashion against the St. Tammany Shockers. The Spice raced out to an early 9-1 lead with a five run first inning followed by a four run second inning. The team was led offensively by Jordan Prout (4-4, HR), Tanner Theriot (2-3), Richard Duke (2-4), and Adam Risinger (3-3) and on the mound by starting pitcher Andrew Richardson and reliever Chris Crane. The team will now play JPRD WEST in the "driver's seat" game at 12:30 PM at Mel Ott Park on Saturday. The winner advances to the championship round. The New Orleans Spice (19-8) will begin its quest for a 3rd consecutive Louisiana 19 and Under Dizzy Dean state title this weekend at Mel Ott Park in Gretna, La. The Spice, who captured the 2006 and 2007 Dizzy Dean state and national titles, will open the tournament against St. Tammany's Louisiana Shockers at 3:30 PM on Friday. The first game of the day at 1:00 PM will feature Pineville/Alexandria's Louisiana Lumberjacks taking on Jefferson Parish Westbank. All games will be played at Mel Ott Park in Gretna, La. The Spice would like to congratulate pitcher Andrew Richardson of St. Paul's and his family on signing with the University of New Orleans! The Spice organization would like to congratulate Shortstop PJ Donnelly on his participation in the East Coast Professional Showcase Tryout on Tuesday in Jackson, Mississippi. He was invited by an association of Major League scouts. Congrats to PJ and his family! Omaha and the College World Series to have a SPICE flavor! The New Orleans Spice will be well represented by former players at this year's 2008 College World Series in Omaha, Nebraska. Spice Alums Nick Pontiff, Paul Bertuccini, Matt Gaudet, and Jordan Brown of LSU will be joined by Jeremy Bleich of Stanford at this year's CWS. Best of luck to them and their respective clubs! Great job! Former Spice Pitcher, Jeremy Bleich of Stanford taken as 44th overall pick by the New York Yankees! The New York Yankees have selected former New Orleans Spice and current Stanford pitcher, Jeremy Bleich, as the 44th overall pick in the Major League Baseball draft! Bleich, who prepped locally at Newman High School, was a key member of the Spice pitching staff on the 2004 team. Congrats to Jeremy and his family! SPICE CAPTURE BR WHITE SOX CLASSIC CHAMPIONSHIP! The New Orleans Spice swept the 16 team BR White Sox Classic this weekend with a 5-0 record in the tournament and defeated the host BR White Sox in the championship game 15-7 at Southern University. Earlier in the day, the Spice defeated the Louisiana Elite 12-3 at Pete Goldsby Field to advance to the title game. The club outscored opponents 54-13 in the championship run. The team is now 6-0 on the season and will next be in action on Tuesday night at Fontainebleau High as they take on the Louisiana Knights with a first pitch set for 6:30 PM. The New Orleans Spice opened the 2008 summer with a sound win over the Louisiana Cubs at Fritchie Park in Slidell, La on Tuesday night. The team threw seven different pitchers, who did not allow an earned run in the game, and combined that with stellar defense and timely hitting! The team will next be in action on Thursday 5/29/08 in the BR White Sox Tourney against the All Star Dodgers at Southern University beginning at 5:30 PM. New Orleans Spice Head Baseball Coach Danny Riehm announced on Tuesday that the 2008 19U Spice will celebrate five years of Spice 19U summertime baseball by wearing special throw-back jerseys. The first Spice 19U summer team was coached by Riehm and Wally Pontiff, Sr. in the summer of 2004 and defeated national power - Chet Lemon's Juice at the World Wooden Bat Championships in Atlanta, GA. Notable members of the first summer team in 2004 are: ULM Shortstop Ben Soignier, LSU Right fielder Nick Pontiff,La Tech Pitcher Andrew Lassere, and Stanford Pitcher Jeremy Bleich. New Orleans Spice head baseball coach Danny Riehm has named Eric Nolting as an assistant baseball coach for the 2008 summer season. Coach Nolting comes from an extensive baseball background and is currently an assistant coach at Salmen High School in Slidell, La. His son, David, who was the Spice catcher on the 2007 Dizzy Dean National Championship club is a catcher at UNO for Coach Tom Walter. SPICE CAPTURE BACK TO BACK WORLD SERIES TITLES! The New Orleans Spice defeated Tennessee, 7-2, on Wednesday afternoon at the Dizzy Dean World Series in Southaven, MS to capture the 2007 Dizzy Dean national championship! This marks back to back World Series titles for the New Orleans Spice. The Spice finish their summer with an overall record of 29-6. Jordan Poirrier was named tournament MVP. Matt Heltz, Craig Schnell, David Nolting, Jordan Poirrier, and Kyle Olasin were all tournament selections! Congrats to all of the players and their families! New Orleans Spice baseball strives to promote an exciting and competitive atmosphere for each and every player. It is our goal to ensure that each player improves week to week throughout our summer schedule by playing only the best competition available. For our summer team, it is of top importance that we help market our players to collegiate coaches and pro scouts around the country in hopes of finding a place in college baseball for all of the deserving players on our club. *Current Baseball Assistant at De La Salle High School in New Orleans,La. The 19U Spice Summer Team - This team is designed to allow juniors,seniors, and college freshmen the opportunity to showcase their talents infront of collegiate and professional scouts while in pursuit of a college or professional baseball offer. Also, this team is a great opportunity for players who have already signed with a college to keep their skills sharp before reporting for fall workouts. This team will take on only the best competition from around the state and country. The schedule will consist of single games, double headers, and tournament play. The schedule will allow players to shine infront of both collegiate coaches and professional scouts. Tony Suarez - Curtis - Southeastern La. Dustin Gilmore - Curtis - Southeastern La. Andrew Laiche - Br Martin - Loyola Univ. Rhett Abraham - Salmen - Northwestern St.
Jeb Huber - Mandeville - Southeastern La. Ryan Collins - Chalmette - Southeastern La. Bryn Thompson - Ponchatoula - McNeese St.
Chris Lizana - St.Paul's - Loyola Univ. Robbie Breaux - ED White - Nicholls St.
Ted Oser - St. Paul's - Nicholls St.
James Callahan - St. Charles Catholic - Loyola-N.O. Taylor Domengeaux - Hahnville High - Loyola - N.O.